VR-Helsinki aims to become the service platform for sustainable tourism. 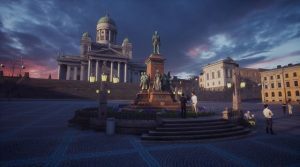 The unique virtual city experience has been developed by the City of Helsinki together with its partner VR-studio ZOAN. Virtual Helsinki will be presented at Slush, the world’s leading startup event, on 4-5 December. Virtual Helsinki is a digital twin of Helsinki that has been created by means of 3D modelling. The aim is to profile Helsinki as a centre of VR/AR expertise, as well as to attract a million virtual visitors to Helsinki in 2019. “Virtual tourism is a globally interesting and growing theme. Consumers are increasingly aware of the climate impacts of tourism and are keen to make responsible decisions. Virtual tourism also supports Helsinki’s own goal of being a pioneer in sustainable tourism while reinforcing our reputation as a city that utilises the latest digital innovations,” explains Laura Aalto, CEO of Helsinki Marketing. Helsinki recently won the European Commission’s new European Capital of Smart Tourism competition, the evaluation criteria for which included the sustainable development of tourism, the use of digitalisation in tourism services, an interesting cultural heritage and innovative tourism offerings. VR-Helsinki combines the same themes. In the virtual city experience presented at Slush, visitors can enjoy an exciting tour of Senate Square, the home of legendary Finnish architect Alvar Aalto in Munkkiniemi and the recreational island of Lonna. The tour is accompanied by music and changing seasons. While many actors in the tourism industry already market their destinations in 360-videos that can be viewed on VR headsets, the concept for Virtual Helsinki is broader. 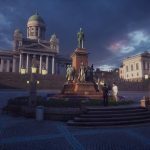 VR-Helsinki allows visitors to move about freely in the computer simulation of Helsinki, and various additional experiences can be created. In the future, VR-Helsinki will serve as a digital platform that enables also service providers to run their businesses. “For example, visitors can tour Helsinki as it was in the early 20th century or purchase Finnish design products and have them delivered to their homes by post. In addition, as virtual reality becomes more social in the near future, friends from all around the world can meet and explore virtual destinations together,” explains Miikka Rosendahl, CEO of ZOAN. “Helsinki wants to offer visitors more impressive experiences. The virtual city experience offers unlimited opportunities to visit Helsinki from the comfort of one’s own sofa. VR-Helsinki can also be used to promote Helsinki as a host city for congresses and events,” Laura Aalto adds. VR-Helsinki will be available as of next year, for example from VR content stores and at various events and venues around the world.